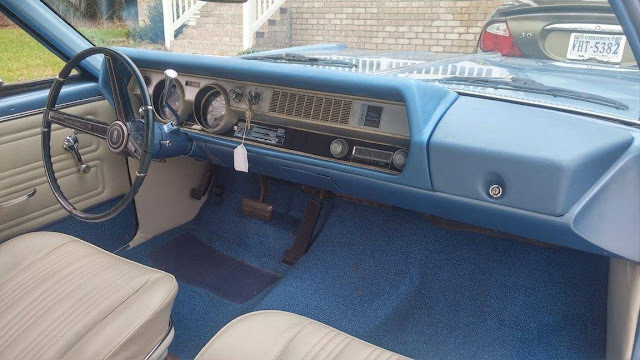 I am not normally a fan of cars that have a vinyl top...or those being listed by a "friend" of the seller...but this next car might just be cool enough to overlook a few strikes and become the next cheap classic in your garage. 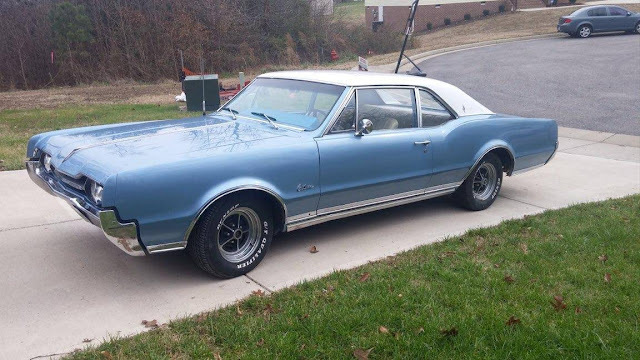 Find this 1967 Oldsmobile Cutlass Supreme Coupe offered for $14,000 in Prince George, VA via craigslist. Tip from FuelTruck. I'm listing for a friend a 1967 Oldsmobile Cutlass Supreme Coupe for Sale. Automatic transmission, 14" chrome magnum 500 wheels , Crystal Blue metallic exterior, white vinyl top, driver's chrome sport mirror, front bucket seats interior with newly upholstery white leather, all new dash board, door panels, head liner, & has AM radio. This Cutlass is a beautiful Classic that has been very well cared for. Don't miss this very special car! NO TRADES & CASH ONLY! Automotive History: The Oldsmobile Cutlass Supreme is a mid-size car produced by Oldsmobile between 1966 and 1997. It was positioned as a premium offering at the top of the Cutlass range. 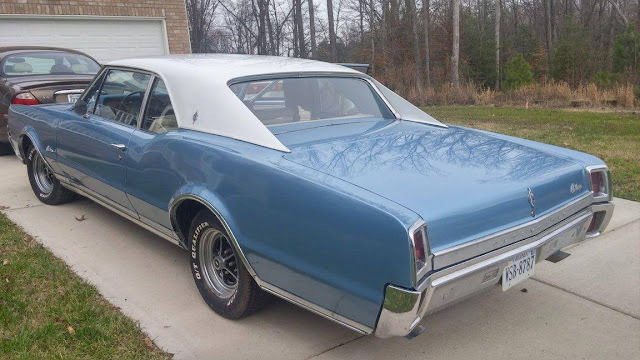 It began as a trim package, developed its own roofline, and rose during the mid-1970s to become not only the most popular Oldsmobile but the highest selling model in its class. It was produced as a rear-wheel drive two-door hardtop, sedan, and station wagon into the 1980s, and a convertible through 1972. In 1988 Oldsmobile sought to capitalize on the brand equity of the Cutlass Supreme marque by replacing it with a downsized front-wheel drive model based on the GM10 platform W-platform. When production ended there was no direct replacement for the Cutlass Supreme, although the Intrigue introduced for 1998 was designed in size and price to replace all the Cutlass models. Not even one shot under the hood either. Must have a crap drivetrain? @JG 750, the words "Oldsmobile" and "crap drivetrain" are hardly ever used together, and for good reason, so your assumption is nothing if not unique. Assuming this was a stock Olds drivetrain when it left the factory, what would be sitting under the hood would most likely be the 330 cu. in. Rocket V-8 with 310 hp and 340 lb-ft. 0-60 came up in 7.3 seconds with the three-speed, 8.8 with the 2-speed Jetaway Hydramatic. Not bad for a car weighing 3400 lbs, 51 years ago. 'the words "Oldsmobile" and "crap drivetrain" are hardly ever used together', unless you add the word diesel to the sentence.